Your cruise departs from Queen’s Quay Terminal in downtown Toronto at 12pm. Aboard a magnificent cruise ship, you’ll travel along Toronto Harbour for 2 hours. Sit back, relax and enjoy views of the beautiful Toronto skyline dotted with landmarks including Harbourfront Centre, CN Tower, Rogers Centre, HTO Park, Sugar Beach, the Redpath Sugar Refinery, Air Canada Centre and the fabled Gibraltar Point Lighthouse -- the oldest landmark in Toronto. Purchase a drink from the full bar and head to your reserved seats for a buffet brunch or lunch freshly prepared by the chef (see Itinerary for sample menu). 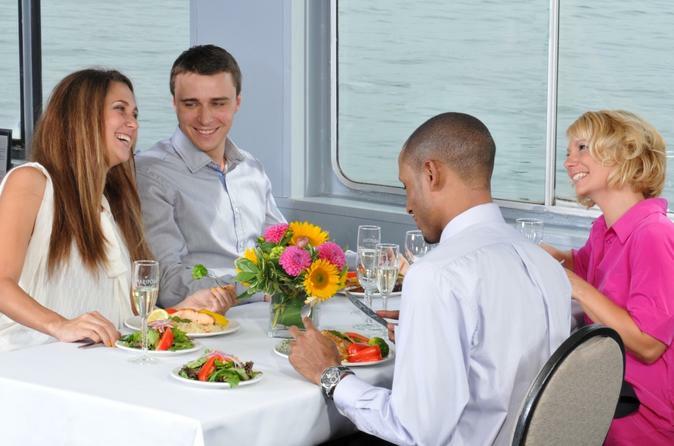 Your memorable 2-hour Toronto dining cruise ends around 2pm.